In this counting game for kids, you are surrounded by adorable alien animals that are just looking for a little affection! However, the creatures have lost their family members in a game of hide and seek, and need your help finding them. In order to gather each creature’s family members together, follow the instructions given. The instructions will tell you which group of creatures to look for. For instance, you might be asked to find all the orange teddy bears. If you see any orange teddy bears, tap on them to help count them up and unite them together. If you are asked to search for all the green creatures, tap on the green creatures spotted to do the same. 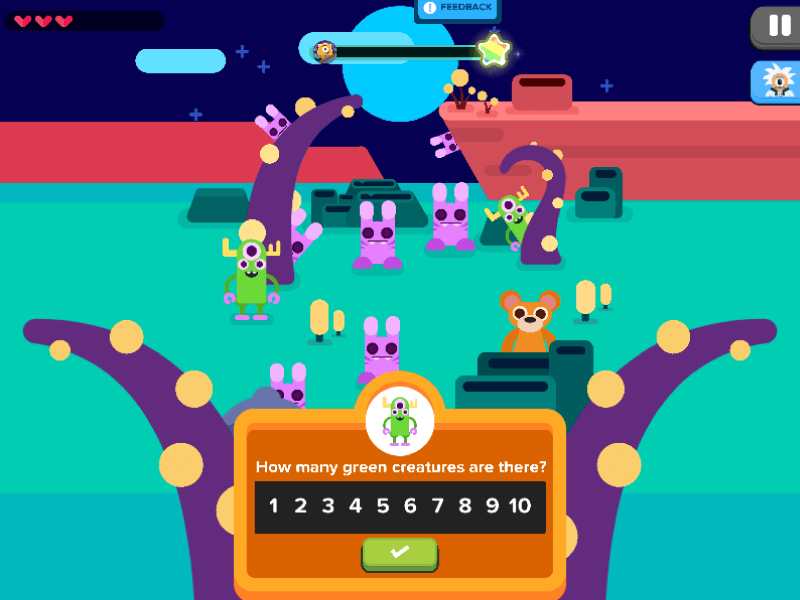 Once you have collected all the specified creatures, tap on the green button to submit your answer. The creatures will cheer in glee for your help in gathering their family members! However, if you end up submitting a wrong answer, do try again as the creatures are counting on you! Counting Wilderness is a seek-and-find counting game for kids that engages you in a search for the matching creatures of a particular group. The gameplay is a fun approach to learning how to relate numbers to objects. By determining how many creatures of the same type there are in each round, you will be taught rote count sequence and numeral recognition. As each creature is gathered, the number bar will show you how many creatures of the same kind you have accumulated. By associating numbers with quantities, you will quickly catch on to bigger numbers and the amounts that they represent. Have a ROARing good time with Counting Wilderness!